Currently engaged in a number of state-wide and regional network-building initiatives focused on food, health and education system change, I am beginning to see some interesting patterns across efforts to build connectivity-based and more fluid movements for change. Watching these dynamics unfold, I can’t help but come back to one of our foundational frameworks at IISC, what we call the R-P-R Triangle, for all that it has to offer our thinking about network strategy and success. This framework (see below) makes the point that any kind of collaborative endeavor is a multi-dimensional affair when it comes to the core determinants and definitions of success. Of course, we often come to the network or collaborative table eager to see results, to work in new ways to have greater impact on the issues that we care most about. Without concrete results or wins, it is hard to justify continued net work. But results are just a part of the story, and the big results may take some time in coming. And relationships, or the kinds of relationships we seek, do not simply happen. This is where process comes into play, the “how” of the work we do. As we imagine our net work ends in terms of the results and relationships we want to see in the world, it is important to design at least some of the doing in such a way that it aligns accordingly. Who do we need to bring together? What boundaries do we need to bridge? How do we bring people together? What are the key conversations we need to have? What resources and roles will support this work? These are especially vital questions to answer as we are in the beginning of and making key transitions in our net work. 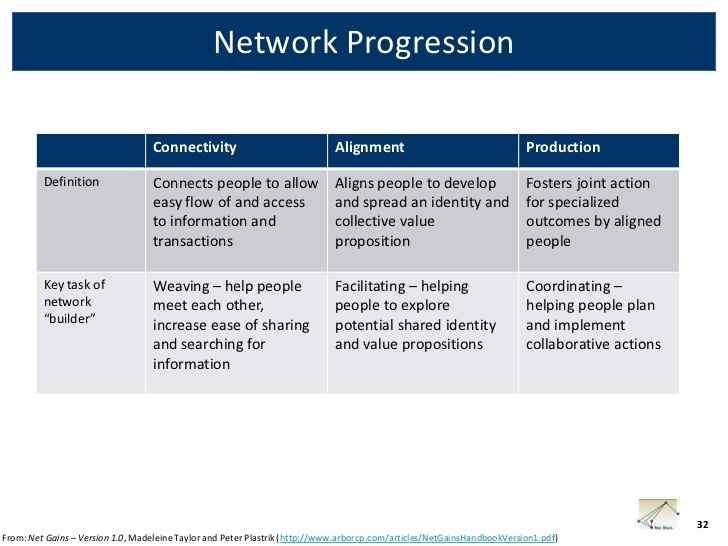 I have also noted how the R-P-R triangle has some interesting parallels to the following matrix from Plastrik and Taylor, which lays out a typology of networks for social change. I think of these less as types and more as modes of networks. All networks rely on connectivity (or relationships) and benefit from intentional weaving. Some will strategically align themselves under a banner of shared vision and/or goals, and rely upon strong process facilitation to do so. Others will move in coordinated fashion to action to achieve more concrete results as a collective. I do not think of these as existing in any kind of developmental framework, such that one always leads to the next. It all comes down to what the network wants to do. So where are you in your network building efforts? How do these frameworks help you in thinking about how best to move forward? Superior, thanks a good deal! Excellent synthesis Curtis and consonant with my own experience in network building. I think that an aspect of process in Network Building comes to us from the lean start up model – “fail early.” Which really is a way of saying – prototype as soon as possible, formulate your hypothesis and be rigorous about your learning. The cool think about this approach is that it is one in which process is very actively driving towards results, but there is a spirit of learning and experimentation that tends to foster a more generative environment. The uncertainty that comes with the absence of a linear plan is in some ways soothed by the emphasis on relationships. And this emphasis on relationships is what nurtures an ecosystem that can yield more than anything that a linear plan could have foreseen. Well said, Gibran. I’m becoming more aware of how much our movements for change fall victim to the spell of solidity and certainty. Trust building and learning builds the path forward!